Ms Elizabeth Macheka yesterday finally spoke on her rocky marriage to former Prime Minister Morgan Tsvangirai, saying their separation has nothing to do with the MDC-T leader’s loss to Zanu-PF in last year’s harmonised elections, or his material well-being. Ms Macheka, in an exclusive talk with The Herald, said their problems were sparked by “sensitive personal issues” that only the two of them could resolve without interference from relatives, friends or party officials. The nature of the problem, a medical one, has been disclosed to this paper. She said like anyone else, it had always been her dream “to be happily married in poverty and in the midst of plenty”. While Ms Macheka kept a tight lid on the nature of the “sensitive personal issues” affecting their relationship, The Herald is reliably informed that Mr Tsvangirai wanted to marry his late wife Susan Mhundwa’s younger sister, Leah, and officially communicated this to Ms Macheka and his family. Mr Tsvangirai, the sources say, strongly believed marrying from the Mhundwa family would resolve the “sensitive personal issues” he is facing. This did not go down well with Elizabeth, leading to a mutual separation a month ago. Yesterday, Mr Tsvangirai denied he planned to marry his late wife’s younger sister. It is understood that Mr Tsvangirai has tried to resolve his sensitive personal problem by consulting Prophet T. B. Joshua, meeting little to no success on that front. Ms Macheka said she was against Mr Tsvangirai’s visits to T. B. Joshua as a Catholic. “A lot has been said and written about how I am to blame in the current situation between myself and Mr Tsvangirai. It is not my intention kufukura hapwa, kubvisa matenga akafukidza dzimba or awaken sleeping dogs. “Let it be known that it is every woman’s dream to be happily married in poverty and even in the midst of plenty,” she said. “He knows the genesis of the problem, what steps he has been trying in vain to address the situation, including visits to TB Joshua and others. The paralysis between us has nothing to do with the outcome of the July 31, 2013 elections, MDC-T, any other political entity, foreign hand or material worth. She said Mr Tsvangirai must not play the victim in the deterioration of their relationship. “Crying the victim or casting aspersions on anyone, including myself, is not only a self-serving sympathy-seeking gimmick but intellectually, factually and morally dishonest stance to take as close friends from both sides of the families and relatives know. “I shall not be drawn into a public discussion of my marital life since it is a private matter and private matters are best solved privately,” Ms Macheka added. Sources close to the goings on allege that although the couple loved each other, the relationship had never been smooth sailing. Family members, including a young brother of Mr Tsvangirai (name supplied), would reportedly spy on Ms Macheka on behalf of the MDC-T leader. They were allegedly paid up to US$6 000 each to do this, and to justify the money they got, they lied to the former Prime Minister that Ms Macheka was a Zanu-PF spy. Ms Macheka is the daughter of strong Zanu-PF cadre Cde Joseph Macheka. It is alleged Mr Tsvangira’s younger brother constantly fed the former PM false stories about Ms Macheka’s infidelity. This was one factor that destabilised the marriage. “He would pay his party security aides to spy and track on Elizabeth, paying them as much as US$6 000. The party spies would also cook stories. When Elizabeth discovered this, she confronted Mr Tsvangirai who did not deny it,” one source said. 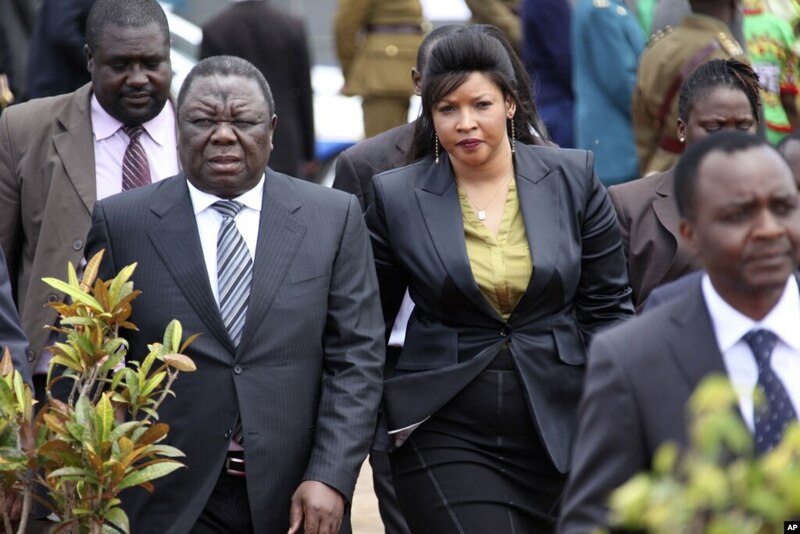 Yesterday, Mr Tsvangirai said he would handle these matters with his wife. “We will sit down and discuss them as two mature adults,” he said. He also denied plans to marry Ms Leah Mhundwa. Mr Tsvangirai said although Ms Leah Mhundwa was “given” to him by her family as part of a Shona cultural practice (chimutsa mapfihwa) following his wife’s death in a car accident in 2009, he never intended to formally marry her. Sources maintain Mr Tsvangirai often visited Ms Leah Mhundwa behind Ms Macheka’s back, further destabilising his marriage when the alleged trysts became known.